Here are some snazzy birthday facts about 29th of October 1951 that no one tells you about. Don’t wait a minute longer and jump in using the content links below. Average read time of 10 minutes. Enjoy! What day was my birthday Oct 29, 1951? October 29, 1951 was a Monday and it was the 302nd day of the year 1951. It was the 44th Monday of that year. The next time you can reuse your old 1951 calendar will be in 2029. Both calendars will be exactly the same! This is assuming you are not interested in the dates for Easter and other irregular holidays that are based on a lunisolar calendar. 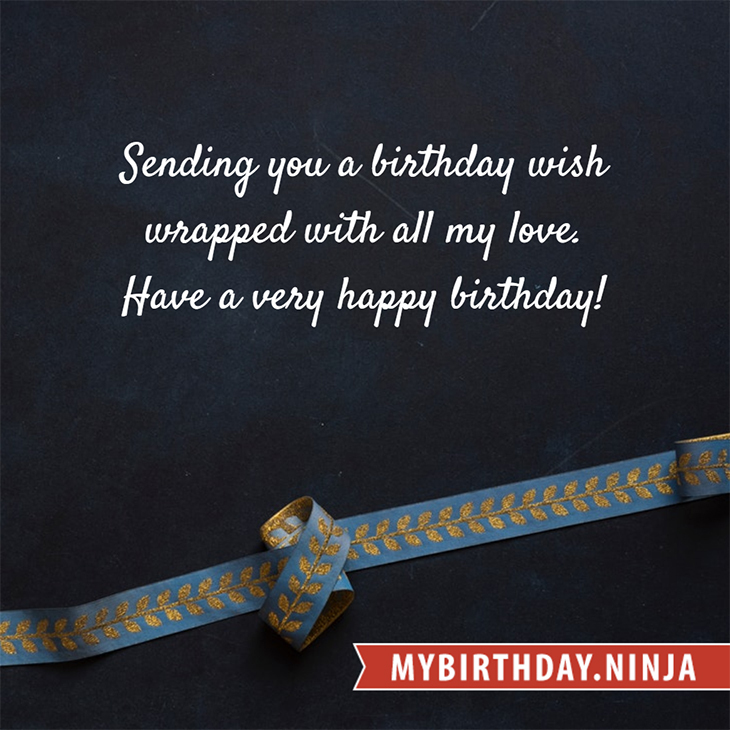 There are 193 days left before your next birthday. You will be 68 years old when that day comes. There have been 24,644 days from the day you were born up to today. If you’ve been sleeping 8 hours daily since birth, then you have slept a total of 8,215 days or 22.49 years. You spent 33% of your life sleeping. Since night and day always follow each other, there were precisely 834 full moons after you were born up to this day. How many of them did you see? The next full moon that you can see will be on April 19 at 11:14:00 GMT – Friday. Fun stat: Your first one billion seconds (1,000,000,000) happened sometime on July 7, 1983. If a dog named Tammi - a German Wirehaired Pointer breed, was born on the same date as you then it will be 357 dog years old today. A dog’s first human year is equal to 15 dog years. Dogs age differently depending on breed and size. When you reach the age of 6 Tammi will be 45 dog years old. From that point forward a large-sized dog like Tammi will age 5-6 dog years for every human year. Battle of Brustem: Charles the Bold defeats Liège. Mozart’s opera Don Giovanni receives its first performance in Prague. Eighteen countries meet in Geneva and agree to form the International Red Cross. Israel’s prime minister David Ben-Gurion and five of his ministers are injured when a hand grenade is tossed into Israel’s parliament, the Knesset. An airplane carrying the Cal Poly football team crashes on takeoff in Toledo, Ohio. A large cyclone devastates Odisha, India. What does my birthday October 29, 1951 mean? Your birthday numbers 10, 29, and 1951 reveal that your Life Path number is 1. It represents initiative, potential and singularity. You are a born leader. You insist on your right to make up your own mind; you demand freedom of thought and action. The following celebrities also have the same life path number: Brina Palencia, Tex Avery, Siedah Garrett, Ryuji Sainei, Garðar Thór Cortes, Tahj Mowry, Colin Jost, Tevin Campbell, Mark Lindsay, Jeffrey Combs. 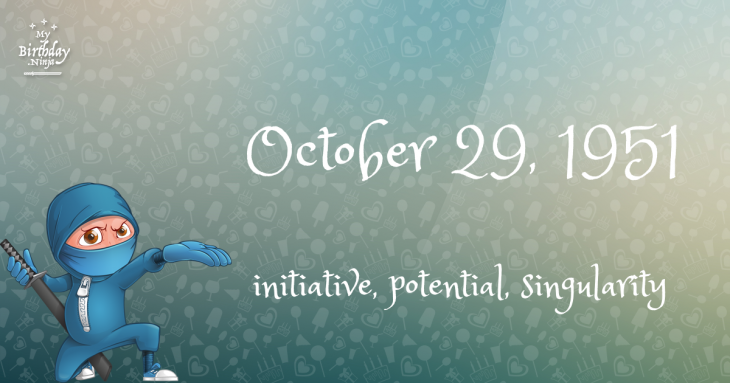 What is the birthday horoscope for Oct 29, 1951? The Western zodiac or sun sign of a person born on October 29 is Scorpio ♏ (The Scorpion) – a fixed sign with Water as Western element. The ruling planet is Pluto – the planet of transformation. According to the ancient art of Chinese astrology (or Eastern zodiac), Rabbit is the mythical animal and Metal is the Eastern element of a person born on October 29, 1951. Fun fact: The birth flower for 29th October 1951 is Cosmos for constancy. What is the Love Match for Oct 29, 1951? When it comes to love and relationship, you are most compatible with a person born on August 1, 1966. You have a Love Match compatibility score of +121. Imagine being in love with your soul mate. On the negative side, you are most incompatible with a person born on April 6, 1970. Your incompatibility score is -118. You’ll be like a cat and a dog on a love-hate relationship. Arf-arf, I want to bite you. Meow-meow, stay away from me! How many babies were born on October 29, 1951? Base on the data published by the United Nations Population Division, an estimated 97,382,033 babies were born throughout the world in the year 1951. The estimated number of babies born on 29th October 1951 is 266,800. That’s equivalent to 185 babies every minute. Try to imagine if all of them are crying at the same time. What is the popular baby name on 29 Oct 1951? Here’s a quick list of all the fun birthday facts about October 29, 1951. Celebrities, famous birthdays, historical events, and past life were excluded. Try another birth date of someone you know or try the birthday of these celebrities: February 6, 1989 – Natapohn Tameeruks, Thai actress; June 2, 1970 – Gökhan Kırdar, Turkish singer-songwriter; September 24, 1939 – Wayne Henderson, American trombonist and producer (The Crusaders) (d. 2014).